Crusaders boss Stephen Baxter is braced for another 90 minutes of high octane stuff at Stangmore Park tomorrow. The Danske Premiership champions may have had to grind out results of late -- winning by the odd goal against Ards, Portadown and Coleraine -- but they at still a whopping seven points clear at the top of the table. 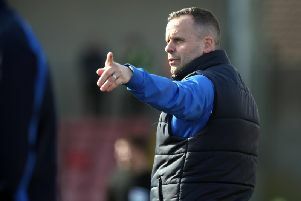 Baxter expects few favours against Rodney McAree's Dungannon Swifts, who are coming off the back of a super 4-1 win at Ballymenat United last weekend. "Dungannon are will drilled, they are well trained," said Baxter. "They showed only last week that they are a match for any team at a venue where few teams have gained much satisfaction this season. "So, we know what to expect. We will require another 90 minutes of high tempo, passion and commitment. "We have had to grind out results of late . . . scoring late goals coupled with our goalkeeper (Sean O'Neill) performing last minute penalty saves. But that's the sign of a good team." Baxter doffed his cap to the performance of Ards last week when it took a 93rd minute winner by David Cushley to pinch the points for the Crues. “They were difficult to break down," he added. “Niall (Currie) set up a shape up to frustrate us. They were compact in the middle of the park and we had to work our way around that. “But I always felt that something would fall for us. That’s why we got Cushley on to the pitch."